Experience the exceptional softness and smoothness of nappa leather with this women's drawstring-waist detachable-hood anorak from Excelled. Featuring a 100 percent leather shell and form-fitting drawstring waist, this anorak keeps you feeling warm and looking your best on cool days. Choose from three attractive colors, and enjoy the nappa leather shell that's supple and lined with 100-percent polyester for superior comfort. Warm your hands or store your keys and phone in the two front pockets. The hood is easy to detach, and the stand collar is convertible, so you can customize this coat to suit the weather. The approximate length from the top center back to the hem is 31 inches. The measurement was taken from a size medium. This was great quality leather but cut extremely large. I did not like fit so I returned it and received full refund immediately. Great customer service!!!! To add, I was a first time buyer. 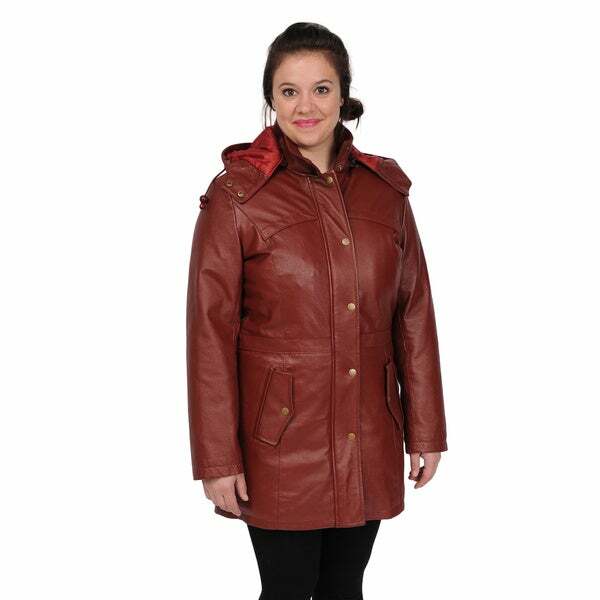 Excellent, bought this coat was too big I returned it and got a smaller size it is perfect feels really good. Would recommend it to anyone who is interested in purchasing one. I love it.and you will too. Love love everything I have order from overstock. "Do I have to pay shipping when I return a clothing item for a different size ?" "how do your leather coats and jackets run? Do I need to order a larger size?" Hello gs, the approximate length from the top center back to the hem is 31 inches. The measurement was taken from a size medium. I would make your size decision based off of that information. Thank you for shopping with us!